You may have heard of the 7 natural wonders of the world, but did you know that Georgia is home to 7 natural wonders of its own? Tallulah Gorge State Park is located a short drive East of downtown Helen, and features one of the largest and most beautiful canyons on this side of the country. At nearly 2 miles long and 1,000 feet deep, Tallulah Gorge is truly a site to behold. While you're checking out this incredible feature, though, you'll also be able to enjoy a wide variety of excellent Helen hiking trails. You're sure to get your exercise, spend some time bonding with your loved ones, and create lasting memories of spectacular scenery along the way. As is the case with all Georgia state parks, you should know in advance that you'll be required to pay a parking fee of $5 (unless you are an annual pass holder). The Helen hiking trails at Tallulah Gorge State Park are then free for you to access throughout the day. Leashed dogs are permitted on all trails except for the Gorge Floor Access and Gorge Floor Trails, so if you plan to visit either of these, you may want to leave your pooch back at the cabin. Be advised, also, that free permits are issued for floor access ear day, and are capped at 100 visitors. It's best to arrive early in order to ensure that you'll be able to hike the floor trail. Regardless of which trails you plan on traversing, be sure to dress appropriately for the weather and bring plenty of water for yourself and any accompanying pets. Situated 28 miles west of Helen, Tallulah Gorge State Park is easy to access via the GA-17 South, GA-285 North, and the GA-15 North/US-23 North to Jane Hurt Yarn Road in Tallulah Falls. The drive will take approximately 30-35 minutes to complete. 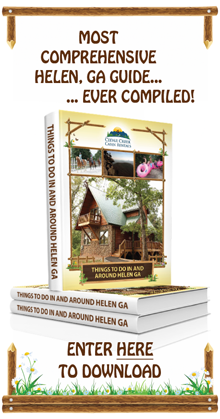 Some of our favorite regional Helen hiking trails are located within Tallulah Gorge State Parks, and it's easy to find a path that will suit your needs and skill level. For an easier, more leisurely hike to enjoy the mountain air and views, access the North Rim Trail from behind the Interpretive Center. Although the path does feature moderate inclines and stairs, it's quite short at 3/4-mile one-way, and is broken up by 5 different scenic overlooks. The first overlook offers the best southern view into the gorge, and both Oceana and Bridal veil Falls can be spotted at the far end of the crevice. Next, you'll direct your attention to L'Eau d'Or Falls, Tempesta Falls, and the Hawthorne Cascade and Pool. From here, you'll notice the remains of a water compressor plant that was used in the construction of the Tallulah Falls Dam before coming to a point that offers superior views of the dam itself. Finally, you'll come upon the scene of the upper Gorge, as well as an overlook to Hawthorne Pool. The South Rim Trail, situated on the opposite side of the gorge from the Interpretive Center, is another 3/4-mile one-way trail that is moderate in difficulty. In addition to offering scenic overlooks of Hawthorne Pool, Tempesta Falls, and Oceana Falls, you'll also be able to view Hurricane Falls, "Devil's Pulpit", Caledonia Cascade, and the Wallenda north tower area. One of the most popular trails within the park is the Georgia Floor Access, which is actually comprised of 600 metal steps. The trail also leads to an impressive suspension bridge that crosses the gorge and connects both North Rim and South Rim Trails. The path along the gorge floor is the most challenging, as it doesn't feature any soil terrain, but is rather comprised solely of rocks and boulders. As such, hikers are only permitted when they are wearing proper hiking attire. Regardless of the difficulty level, the views afforded on the trail are a draw to nature enthusiasts and adventurers. The beauty of Tallulah Gorge State Park is that there are tons of incredible sights to see from the Helen hiking trails. Among the cascades, Bridal Veil Falls and Hurricane Falls (as well as its adjacent pool, creating gorgeous reflections of the foliage throughout the year) tend to be the most popular. Still, the biggest draw is the gorge itself. The largest canyon East of the Mississippi River, the gorge is a very impressive sight, and as you walk around the rim, you'll continue to notice new and interesting features throughout the landscape, while taking in the majesty of nature throughout the year. 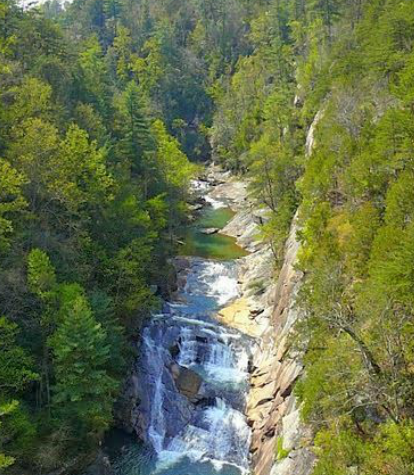 Are you planning on visiting Tallulah Gorge and other regional Helen hiking trails? Feel free to ask us any questions that you may have so that we can help you complete your trip itinerary.